I was reading my twitter feed and feeling concerned about the earthquakes in Christchurch and the enormity of what is happening in Libya and wondering about our capacity to be ghoulish voyeurs in times of crisis and feel helpless, overwhelmed and powerless. Someone commented that it’s a crisis a week at the moment what with floods, cyclones, bushfires as well as a revolutionary fervour rolling through northern Africa and the middle east. 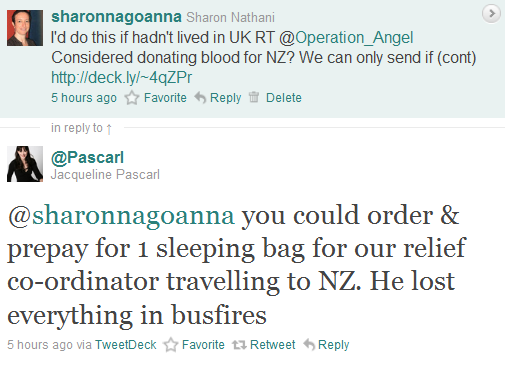 Anyway, I came across a tweet from @operation_angel which is the not for profit organisation set up by Jacqueline Pascarl (famous for the abduction of her children by her Malaysian prince ex husband so many years ago). Operational Angel now acts as a resource for areas hit by disaster and I noted a few weeks ago that they were gathering together resources – and not cash – to help out the QLD floods. They had amusing posts asking for knickers, gumboots, sanitary napkins and things which really are essential, but probably not at front of mind when a natural disaster hits. I decided to follow their twitter feed mainly because it made me smile – they had silly puns and it was always fun. Mind you, I didn’t send them any gumboots or knickers. I was thinking they needed pallets and pallets full and that they were appealing to people with shops and stock and quantity. (But I felt virtuous by supporting them in spirit). The way it works is that they act as a conduit to ship these items to where they are needed (so you can post stuff to them and they will forward it – they never ask for money). Today they asked for blood donations from Australians for Christchurch. My longterm excuse for not donating blood is that I am ineligible to do so, as I lived in the UK in the mad cow years and the blood bank considers me to be at risk of carrying BSE (even though I never ate a hamburger while I was there). I call it my “excuse” because I am actually very squeamish and know that I would faint if I were relieved of my plasma. But – I thought this was a good idea – so I thought I could help out by publicising this need, and re-tweeted their message with my own little addendum (ie great idea, I would help out like this but I am not allowed to -see pic at bottom of page). 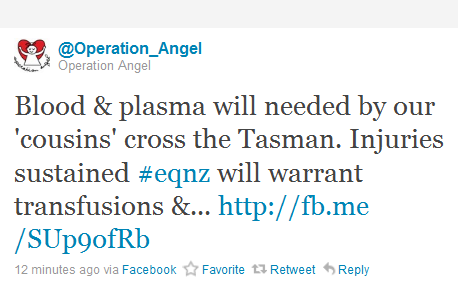 Lo and behold, within 10 minutes, Operation Angel came straight back to me with a suggestion of how else I could contribute – a very clear, tangible thing – something they need which will help them work in Christchurch on relief efforts. They called me out on copping out of donating blood myself – they could see that I wanted to help somehow, and they asked me to buy a sleeping back for their relief coordinator, Dean, who is going to Christchurch on Monday. How could I say no when they even sent me the link to where I could acquire one for them? I think we should never underestimate the power of a direct ask – not only did I feel special that I could make a particular contribution that connects to something I can understand, but it furthered my relationship with both the organisation and the relief worker (whom I contacted via facebook). In a way, they were challenging me to put my money where my mouth was – and this was one of the most satisfying interactions I have had all week. Let’s not forget that social media is social – and that if we utilise our networks well, we can see great results. I am hoping to complete the purchase of the sleeping bag tomorrow (unfortunately the online checkout at Aussie Disposals wasn’t working today) and Jacqueline will collect it from the store not far from her. let people contribute in the ways that they can – don’t only dictate what you want and need but have it broader (in case they can’t help in the way you feel you most would like). I have learned something from this about creating connections, and feeling that I can contribute in surprising ways. What do you think about direct and personal calls to action? What do you think motivates your donors? #Philanthropy. Posts by Sharon Nathani, provisional PhD candidate at Swinburne, philanthropy consultant and blogger. Board member Outer Urban Projects and Pathways Melbourne. Sharon's study is supported through an Australian Government Research Training Program Scholarship. This entry was posted in donate, fundraising, philanthropy, social action, social media and tagged Christchurch, direct ask, donor motivation, earthquake, Jacqueline Pascarl, Operation Angel Australia, social media, social network, twitter. Bookmark the permalink. Of course donors should not have to feel special. They give just for the cause, don’t they? Well maybe. But your post expresses two vital messages. First, we are all susceptible to good personal communications. Sure we get lots of computer generated letters. Personalised of course. Some of them strike a chord. Some fail completely. The key is to trigger that impulse that originally made the donor think well of the cause (and the funding channel) in the first place. It is a fragile thing and can be destroyed in a moment. Donors are all individuals. Even corporate donors are run by individuals. Because you give five dollars does not mean you can necessarily afford ten. I often wonder why so many special pleadings fall so flat. It is because they do not think about the individuals they are pursuing for support and what brings them to a commitment to the cause. Take the time to know your donors. It will bring rewards. The second is that simple truth. I heard it somewhere long ago and it rang so true: what are the three letters which can get you everything you want? A.S.K. If you don’t ask, you don’t get. But make damn sure you ask nicely. Thanks John. Yes, good personal messages are so effective – if only we can all learn how to communicate without overdoing it, sounding twee or contrived then surely all our fundraising goals would be achieved in no time at all. For me the key here was the direct challenge which was friendly and not too confronting (but a little bit confronting – gosh – they were asking me to actually do something – and it wasn’t a one-click easy give – (I had to make some phone calls, write some emails and deal with a nonworking website)). I sometimes wonder whether gift seekers, especially those in the arts, are too timid for their own good – after all – the worst that can happen with a direct ask is that a gift doesn’t eventuate. this has shown me that bolder is better. First of all, immense #gratitude to you for your huge response to Operation Angel’s request for a sleeping bag for our ‘Deputy Dean’. I’m sure Jacqueline put the ask out to you on the off chance you or someone you know might be interested – but your generosity and your open, honest, analytical blog post on the topic is a huge help. For you to compare Operation Angel’s approach to that of a ‘Networked Nonprofit’ is a compliment of the highest order and something we strive for each day. Operation Angel is blessed to have such an engaged, enthused, seemingly never tiring supporter base and this is what keeps us going and is what delivers results to the people affected by natural disaster. I am proud to also be helping Operation Angel in my small way and am thrilled that you have been helping in all your many ways too. Can’t wait to see a pic of our ‘Deputy Dean’ snuggled up in that sleeping bag! Sarah I suppose the best way to talk about the importance of philanthropy is to demonstrate not only how to do it as a fundraiser, but to talk about how it feels to contribute (even in very small ways), and this whole exercise had me engaged and enjoying it (and realising that I could tell a story about it which I hope resonates). I am also chuffed that you considered my blog post to be analytical – as that is what I was aiming for – not just a self congratulatory pat on the back – and yes – if a photo of Dean with the item becomes available I will be glad to circulate this.